What is up with Clint Eastwood, churches, and men of the cloth? A great many of his films toward the latter part of his career (Changeling, Mystic River, Million Dollar Baby, and Gran Torino) have prominently featured not only issues of faith but actual scenes in churches and/or principal characters who are clergy. In Changeling and Torino, these supporting characters even help shape the plot. Now, in case you hadn’t noticed—and you honestly might not have—this is something of a rarity in Hollywood Films. Typically, films that include such scenes and characters are either wholly about the practice of religion—such as Saved! or Doubt—or include such material solely for the sake of satire or comic relief. But Eastwood doesn’t tread either of those mainstream paths. Instead, the stories he films genuinely explore the nature of faith and the thoughts of those who either doubt or believe while keeping the Holy Edifice on the periphery. Now, is he complimentary of the Church or religion? Hardly. But he’s uniformly complimentary of very little, so his treatment of these subjects is at least thoughtful and even-handed. So I wonder: Is he trying to point out the limitations of faith? Is he trying to remind us that people are perfectly capable of living a life of faith without the help of organized religion? Is he rather arguing that one can be just as decent and moral a model without faith altogether? Is he commenting on the jumbled, complicated dilemmas that face us all, regardless of faith or skepticism? Is faith, perhaps, merely incidental to a filmmaker who sees everything as mundane or trivial yet nonetheless integral to life? Walt’s neighborhood is changing as various dark-skinned ethnic groups replace the white-skinned ethnic-heritage auto workers Walt once knew. He chafes at the presence of the Hmong family who lives next door, yet hates the gangs that cruise the streets and harass the neighbors even more. When he breaks out his Korean War rifle to confront them and starts in with his “gooks” and “slants” rhetoric, we’re pretty sure we’re dealing with a tortured and self-centered cantankerous bigot. His observation to the priest even tilts that direction: “The thing that haunts a man the most,” he intones, is the horrible thing that he does voluntarily. This all heads toward the inevitable confrontation. “I knew this was gonna happen,” Walt moans. But as the story progresses and we learn a little more about Walt, his friends, and the ways in which he invests in his neighbors, we conclude that we really didn’t know Walt. In fact, if we find the film’s conclusion credible, we have to accept that Walt is not a man to be feared and reviled but a hero to be admired. As Eastwood again opts for representationalism over actual realism in the staging of his scenes and characterizations—Could Walt actually down a dozen beers and remain essentially sober? Would Hmong teens be so coolly tolerant of the old Polish coot who crashes their basement conclave? Can priests actually face down recalcitrants in bars that easily? Do witnesses really come forward that readily, and do armed thugs lay down weapons easily?—you can be pretty sure that he’s not just telling a story: the details themselves just don’t hang together all that well for pure storytelling. Rather, this is a parable, not unlike the story of the “prodigal son,” in which characters represent one thing or another and are not intended to be taken quite literally. Is Walt a coot? Is he a racist? Is he hateful? Is he impossible to please? Is he “not the kind of Old Man” you could envision being loving, merciful, and gentle? Is it just possible that the problem is not with the Old Man, but with our perceptions of the Old Man? After all, Walt’s final act is not exactly what we’d expect. Turns out that Gran Torino is quite the vehicle for exploration of theology. Whoda thunk? Are you following this at all? Now, I could be completely off the rails with this reading: Eastwood could simply be continuing his role as Hollywood’s social iconoclast, never being ready with a simple answer. 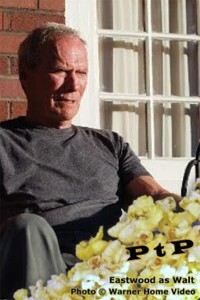 But even if that’s the case, I find it very refreshing sitting down to watch an Eastwood flick. You might not find the drama completely believable, but you’ll find a twist or two you don’t expect, and you’ll have plenty to talk about for days afterward. And here’s where I’m leaning with those body-of-work questions I posed earlier: Eastwood really is just an observer of the jumbled, complicated ethical and moral dilemmas that face us all, regardless of faith or skepticism. “Nothin’s fair, Father,” as Walt advises his priest, echoing the sentiments of William Munny in Unforgiven. But at some level—one which I believe God could appreciate, presuming he’s out there—Eastwood’s a believer of the best kind, no matter what one believes: the kind who thinks deeply about what he believes, and questions it constantly. Gran Torino is now included with your Amazon Prime subscription. You can also stream at YouTube.